Five Top Wedding Faux Pas that we have seen play-out a more than a few weddings over the years. I thought it would be a good idea to list it on this week’s blog. Every once in awhile, a female guest will show up at someone else’s wedding wearing a white or ivory dress – similar to this one. White or ivory is one of those colors that is usually reserved for the bride, unless it is chosen by the bride for the bridal party to wear – just like Kate and William’s wedding. I don’t recommend wearing white, but if you choose to go down this rabbit hole, be prepared for a few stares and it might be a good idea to take one of your friends with you when you go to the ladies room for a little protection. If you have to give a toast, please try and do it sober. We understand that sometimes it takes a couple glasses of wine to work up the nerve, BUT, when you are under the influence, you could say something that you can’t take back. If the wedding is being filmed, well that could haunt you unless you can find away to bribe their videographer to erase your cameo appearance…. Same goes with having an open microphone at your wedding, this can be fun at the local comedy club, but I have seen it go terribly wrong at weddings. From time to time, a client will insist on having a long cocktail hour. We always respect our client’s wishes, however, each time we can see the energy level amongst the guests drop. The guests get bored. If you have to have a long cocktail hour, make sure you have plenty of appetizers, ice, libations, heaters and great entertainment to keep things moving. When a guest shows up without sending in their RSVP, it can delay the start of the event and the couple’s grand entrance. In preparation of an event or wedding, hosts spend a lot of time on their table layout and seating assignments. An experienced event planner or a captain knows how to handle these situations, but if there is not one present, then the hosts have to try and accommodate the surprise guest before they can enjoy their own party. This is an interesting custom that can go down hill really fast. Brides spend two hours in hair and make-up and the cost is not inexpensive. 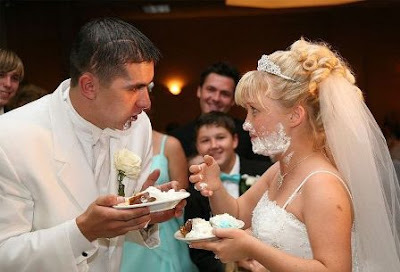 The idea of having cake and frosting decorate the bride’s face seems wrong. I don’t know this couple (we pulled the photo from the Internet), but I am willing to bet that he just realized that she is not laughing anymore….